I am halfway done but it feels like I still have a long way to go. Sigh. I was going to go to the commissary today but with the eclipse I decide to wait until tomorrow. I look through the fridge to make sure I have enough compliant food to get me through the day. Should be okay. I am feeling quite lackluster about food these days anyway. I am so not in the mood to deal with grocery shopping. All that temptation but it has to be done. I am tired and crabby and the return of triple digit heat is not helping. On my drive to the commissary I have a little talk with myself. (Hopefully the other drivers just think I am on a hands free phone.) I remind myself that it is just hormones going crazy and hopefully in a few days I will be back to feeling “normal”. The only really critical task that has to be done today is shopping. Dinner can be leftovers with a bag of salad and there are some Trader Joe’s meatballs in the freezer if something more is needed. 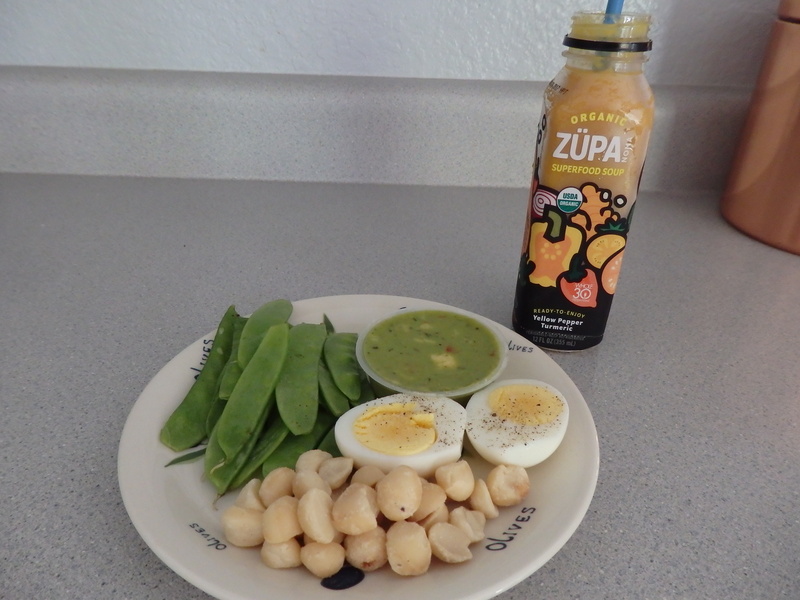 Lunch, I felt sort of snackie: snow peas and guac, hb egg, macadamia nuts and cold soup. I give myself permission to take the rest of the day off. I can color or work on the puzzle, watch a movie, take a nap. The sky is the limit! Food prep day. Happily I am feeling a bit better so the task doesn’t feel so onerous. I make the quiche of the week. I use the kale and ground pork already prepared from the freezer. I add a grated carrot for color and extra nutrients. I found a half a bag of already cooked shrimp in the freezer and made a simple shrimp salad: finely chopped onion and celery, a bit of mayo and some dill. I am looking forward to having something different for lunch. I feel like I have eaten a ton of meat lately. This reminds me to thaw some chicken for later this week. No “tiger’s blood” for me these days. I didn’t really think healthy eating would be able to trump crazy peri-menopausal hormones. I remind myself of my goals: stop snacking, less sugar. I am accomplishing both these days. I do wonder if I am still losing weight though. I decide to add more vegetables to my meals and less sweet potatoes and yams. I made myself a batch of “Melissa’s Chicken Hash” for lunch today and found myself wondering if I would eat this if I wasn’t on the Whole30. Hmmm. Aside from limiting snacking and desserts (I have a plan!) I haven’t given much thought about how I want my meals to look post Whole30. I want to eliminate processed foods for the most part. But I think I am okay with eating just about anything if I make it myself. I started buying heritage flour that is grown and minimally processed locally. I am adding more organic items to our diet all the time. As long as I continue to incorporate more veggies into my meals I will consider it all good. Took my photography class today, hardly thought about the Whole30 at all. I had my first cheat today. I chewed 1/2 a piece of sugar free gum during bowling. I just needed it. Banish me from the Whole30 Hall of Fame. 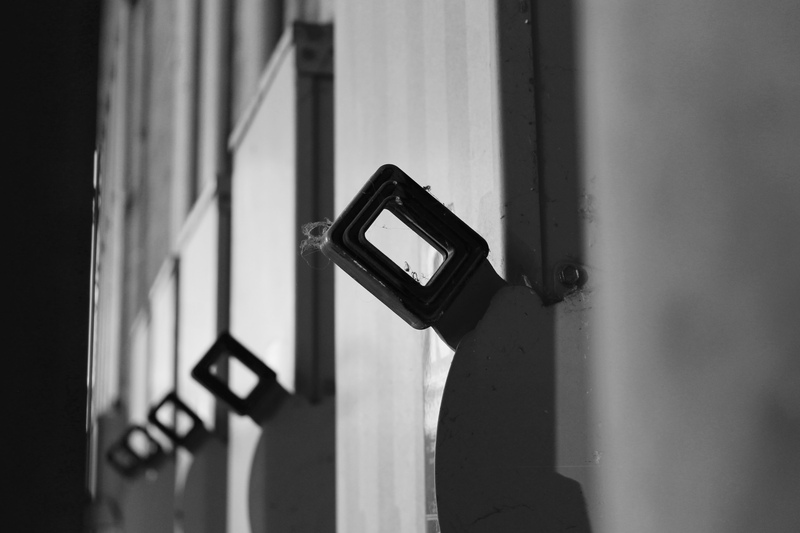 This picture is from my photography class. My instructor called this “Chipotle Art”. Where you take a picture of something ordinary and make it black and white and voila, art. 🙂 I was working on depth of field with this one. Onto to week 4 with a decidedly diminished lack of enthusiasm for food. After a bit of thinking and a lot of doodling I have come up with THE LIST. Since I won’t be starting until mid-January there may still be some tweaks but for the most part this is what I am going with. They are in no particular order and I will be implementing these habit changes one at a time using the “Zen Habits” method. I doubt they will all get done, actually if I have just two or three new habits firmly entrenched by the end of the year I will call it success. @ I am already doing most of these things to some degree but I want to try a little harder. I have begun looking up all the ingredients on things like crackers and cereals and researching to find the healthiest flours. @ this one is going to be tough because I don’t really like to exercise. I also need to be flexible and adjust my routine to fit the time of year. Swimming in the summer instead of walking for example. But this is where the Zen Habits will be very helpful. @ I had already started on this goal, I thought it would be a good one to give the “Zen Habits” method a practice run with. But then I got sick and now I need to start over. Such is life. Goal: to write enough that I can think of myself as an author, to feel a sense of purpose, to add another dimension to my day. @ I enjoy taking nature photos and am ready to up my game. The last few years I have made myself a calendar and I want 2017’s to be fabulous! Hopefully I will have the patience to take my time and attend to each new habit properly. This time next year my days will look very different if I am successful. I am looking forward to change, feeling better and discovering who I can be in this next phase of my life.